While enjoying some tasty Sylas and Maddy's ice cream and an evening Mass Street stroll, Blaine and I meandered into the Japanese Friendship Garden. "The Japanese Friendship Garden," says the Lawrence parks website, "was built to honor the 10 year anniversary of Lawrence's relationship with its sister city, Hiratsuka, Japan. The City of Hiratsuka sent representatives to Lawrence to help design, plan and work on the project. The City of Hiratsuka shipped two major pieces from Japan, a lantern and a 15' stone tower to be displayed in the garden. Approximately 90 feet across and 92 feet deep, [the garden] contains a Wisteria covered arbor walkway, an arbor house, large rocks, water and imaginative lighting. Plantings included Japanese maples, yoshino cherry trees, yews, bamboo, juniper, and mugho pines as well as azaleas, spirea, viburnum, Siberian iris, and peonies. 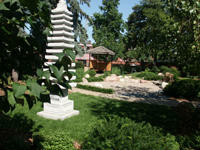 The Japanese Friendship Garden provides Lawrence citizens a quiet oasis in the middle of downtown." This is a wonderfully intimate, secluded spot. The trees are planted such that once you're in the garden you almost don't even know you're downtown. I'm not generally a fan of a lot of "non-green" stuff (like statues and arbors) but here it was done very well. The structures blend into the garden instead of being obtrusive. Also, usually in places where I've seen a rock garden, the rock garden almost is the garden. It's overwhelming. I can't picture how anyone would ever want to go out and meditatively rake the rocks into patterns because it just seems like they would melt in the sun. It's more like a dessert than a garden. Here, it's not so. The area around the rock garden is so lush and green that you can almost see yourself out pondering life, moving the rocks while enjoying a nice sunset.